Find Russell Hobbs products online and buy from the best online shops in New Zealand. From unhappy beginnings some great companies can emerge. This is very true of the famous Russell Hobbs firm from England. It is the end result of two men encountering challenges in their careers following service in World War II. The first was Bill Russell, a Major in the Royal Electrical and Mechanical Engineers and Peter Hobbs, also a Major in the REME during the war. The two each went separate ways when the war ended - though both ended up working for household appliance makers. They each worked in development within bigger firms, but when they each had disagreements with their employers they decided to work together. This was in 1952, and they decided to call their firm Russell Hobbs Ltd. and continue along the same lines; designing household goods. This they were able to do, and the company was always "in the black" from its very first year in business. Russell Hobbs' first product was also a first for the rest of the world - the first automatic coffee percolator. After that, they created automatic kettles, coffee pots, toasters, tea makers and more. The firm was the first to create a programmable kettle, a plastic kettle, and a heating element that boiled water faster than any other before it. The firm also branched out into other types of floor care, cookware, bake ware, and some heating appliances. This diversity within the product line up is only possible because of the great changes the firm has undergone over the years. Though both founders remained active in the company for decades, ownership did not remain within their hands at all times. For example, in 1962 the firm was sold outright to Tube Investments which was a conglomerate of several appliance brands. This caused the focus of the company to branch out accordingly with several facilities being developed in order to meet manufacturing needs. Eventually, TI would sell their holding to Polly Peck International, and this created Russell Hobbs Tower brand. Things did not go well, and by 1991 the firm was a losing enterprise. After a few more exchanges, Salton Inc. acquired the firm, and in 2007 it merged with Applica Incorporated and renamed itself Russell Hobbs once again. This new entity was eventually brought into the Spectrum Brands group, which is a global entity specializing in top of the line home goods and appliances. This new entity upholds the longstanding reputation of the firm by emphasizing the goal of meeting or exceeding consumer needs with every product made. The firm still designs its products in the UK in order to meet the specific needs of the UK market. They also stay on the cutting edge of design and customer relations. They offer a Facebook app for customers to use in order to get service or questions answered, and they have recently won the 2012 Red Dot Design Award. 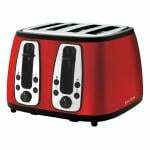 Clearly, their long journey and ongoing success as the number one maker of kettles and toasters in the UK demonstrates that the designs of Russell Hobbs are classic and assured. They provide dependable customer service, stay on the cutting edge of technology, and remain innovative in all they produce.